This image, obtained using Cassini's Visual and Infrared Mapping Spectrometer (VIMS), shows the first observed flash of sunlight reflected off a lake on Saturn's moon Titan. Aflash of sunlight reflecting off a hydrocarbon lake on the surface of Saturn'smoon Titan has been spotted by NASA's Cassini spacecraft, confirming thepresence of liquid on a part of the surface of the hazy satellite with manylake-shaped basins. Theimage taken by Cassini is the first that shows such a glint of light off liquidfrom another world. "Titanjoins Earth in this unique respect," said Bob Pappalardo, Cassini projectscientist, based at NASA's Jet Propulsion Laboratory in Pasadena, Calif.
TheCassini image processing team pinpointed the reflection at the southernshoreline of a lake called Kraken Mare. The sprawling Kraken Mare covers about150,000 square miles (nearly 400,000 square km), an area larger than theCaspian Sea, the largest lake on Earth. Theliquid, like that filling other lakes on Titan's surface, isn't water, as it ison Earth, but methaneand ethane ? molecules of carbon and hydrogen atoms. For 20 yearsscientists have theorized that these liquids existed on Titan's surface, and itis the only other body in the solar system besides Earth that is known to haveliquid on its surface. Thesestores of liquid hydrocarbons on Titan are of interest to scientists because ofthe potential for these chemicals to create an environment supportive of life. In2008, Cassini scientists using infrared data confirmed the presence of liquid inOntario Lacus, the largest lake in Titan's southern hemisphere. But theywere still looking for the smoking gun to confirm liquid in the northernhemisphere, where the basins are largerand more numerous. Cassiniscientists had been looking for the glint, also known as a specular reflection,from a hydrocarbon lake since the spacecraft began orbiting Saturn in 2004. 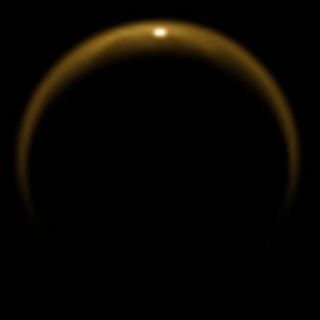 Butuntil recently Titan's northern hemisphere had been veiled in winter darkness. Withthe seasons changing now, and the return of sunlight to the northernhemisphere, Cassini was able to snap a picture of sunlight glinting off thesurface of a lake on July 8. "Thisone image communicates so much about Titan ? a thick atmosphere, surface lakesand an otherworldliness," Pappalardo said. "It's an unsettlingcombination of strangeness yet similarity to Earth. This picture is one ofCassini's iconic images." ThoughTitan's surface is usually shrouded from view by the moon's thick, hazyatmosphere, infrared light is able to pass through, which is how Cassini sawthe glint.